1976 Mako 23 CC 1976 Yamaha 225 125 PSI x6 Cyl -Compression, Power head rebuilt has 125hrs. New Floor and stringers. Garmen GPS, Sounder 168. Marine radio. Trailer 2007 Aluminum trailer with dual axel excellent condition. 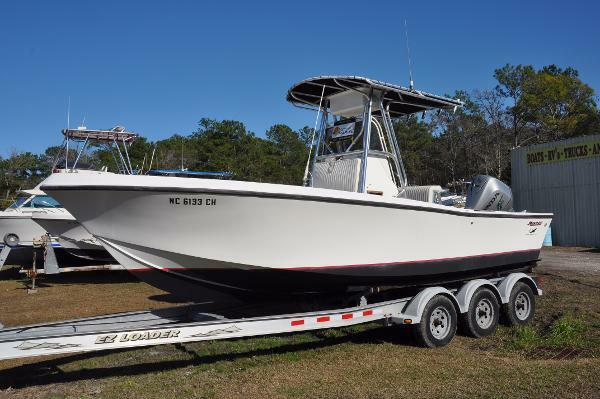 1990 Mako 23 CC FANTASTIC OFFSHORE FISHING MACHINE !TOUGH AS THEY COME – GREAT CONDITION !2008 RE-POWER – 265 HOURS – NEW BOTTOM PAINT !SHE WILL TAKE YOU WHERE THE BIG FISH SWIM !WE ENCOURAGE FAIR OFFERS!Mako is a legendary name in great offshore fishing boats. This may be a 1990 boat but that is when Mako built boats that were tournament battlewagons. She is tough as nails and will last forever. She looks fantastic, and rides and runs like a brand new boat. She was re-powered in 2008 with a new Honda 225 hp 4-Stroke and controls and has only 265 hours of use since then. She has had professional service since new, and has a fresh water pump in her now. This is quite possibly one of the best handling offshore boats ever built, and handles like she is on rails. She has all of the normal fish and bait boxes, rod holders, and a bow casting platform with dry storage below. What she does not have is a trailer but Magnum Marine sells new Venture Trailers, and often has used trailers in stock.Her T-Top will keep you out of the sun and her electronics box is handy. She has a AM/FM Stereo and a VHF radio on board. 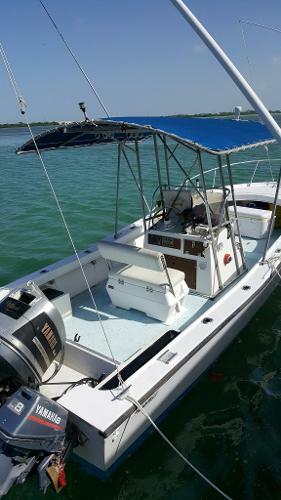 This is a well cared for re-powered offshore boat that looks good and can get you out on the water for a fraction of what a new boat would cost. Her design is timeless, and works better than a new boat. She can take your family swimming, pull a tube, take your family fishing, take you to an Island for a picnic, or just for a cruise down the waterway. Whatever the task, she will do it well. Don’t miss this rare jewel. Call me, the hardest working broker in North Carolina ! WE SHIP WORLD WIDE !WE OFFER LOW COST FINANCING ! WE ACCEPT ALMOST ANYTHING IN TRADE !